Wool area rugs can be quite an investment and are an eye catching addition to any home. Since wool rugs are made of natural fibers, maintaining and cleaning wool requires special techniques and extra care. In addition to regular care, annual professional cleanings services are recommended for this type of carpet. Just like installed carpet, dirt, allergens, and other debris rub against the fibers of your wool area rug and can damage them. It is very important to use a quality vacuum to remove this debris on a regular basis, wool area rugs should be vacuumed just as often as installed carpet in your home. 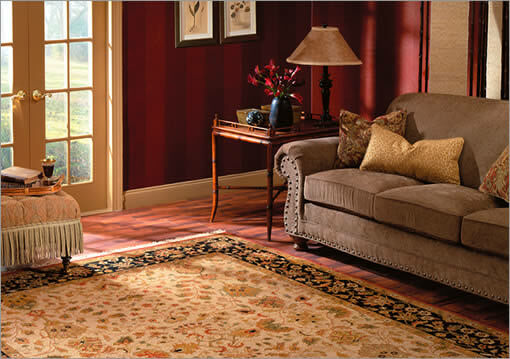 In the first few years of an area rug’s life, it will shed the excess wool fibers left over from the weaving process. These fibers should be vacuumed frequently to help minimize shedding. Once a year, wool area rugs should be thoroughly cleaned for removal general grime that a vacuum can’t touch. This will brighten the rug, giving it an almost new appearance, and extend its life. For any type of wool rugs (Persian and Oriental), do-it-yourself cleaning is not recommended. Wool can be very tricky to clean and work with, which is why professional cleaning is the best choice. Wool fibers absorb much more water than synthetic fibers, which makes them hard to dry and difficult to maneuver because of excess weight from moisture. In addition, many carpet cleaners these days are not experienced in wool rug cleaning. Proper cleaning solutions must be used on wool as a preventative of bleeding (color fastness) and browning (pH imbalance). Avoid cleaning your wool area rugs with bleach, hydrogen peroxide and alkaline spot cleaners. These products will cause permanent damage that is irreversible involving spot discoloration, browning and bleeding. For professional wool area rug cleaning contact us at 951-787-8787 serving Riverside, CA and surrounding areas.